For more than a century, leading citizens of the Paris community have responded to philanthropic opportunities, ranging from social services to cultural, educational and recreational needs. Some initiatives were from religious organizations; others from prominent individuals who helped finance projects for the betterment of the community. Examples can be found in the former Edgar County Children’s Home which served orphaned or youth in need for more than 100 years, and the Community Nurse and Welfare Association, established through the efforts of a local industrial family. Civic-minded individuals who commanded disposable financial resources took the lead some 50 years ago in acquiring and donating land for city parks and industrial development, and later led community efforts to establish the “new” Paris Community Hospital, and the Paris YMCA. However, for the most part, these opportunities did not accommodate widespread citizen participation. Yet there continued a desire on behalf of some to “give back” to the community, which made possible a productive life. To further that goal, three Paris businessmen-industrialists, Joe Hasler, Charles Willis and Robert Morgan, established the Edgar County Community Foundation in 1993, patterned after similar community foundations in cities large and small. 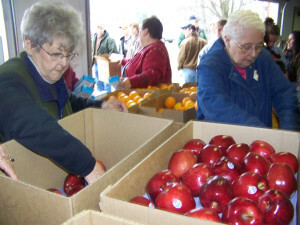 When the Foundation was introduced to the public in 1994, founding director Joe Hasler explained: “Although there are many worthwhile organizations meeting specific needs in the community, there has been no conservative, professional vehicle to benefit the overall community.” This led to many locally earned assets left to charities and foundations outside the Paris area. The Edgar County Community Foundation provides a means to correct this omission. The Foundation is established as a charitable organization as determined by the federal Internal Revenue Service (501-C-3). An enlarged board of managers was put in place to oversee acquisition and use of Foundation assets. (See biographies of directors.) Due to the growth of the Foundation and the need for increased collaboration with similar efforts, both locally and regionally, a Foundation Development Manager position was created and filled in 2006. The Edgar County Community Foundation is affiliated with the National Council of Foundations, The Illinois Alliance of Foundations, and The Chicago Donors Forum.